The people of St. Mary’s had always been involved in special apostolates themselves, and the 1970’s were no different. On June 29, 1975, a “Preparation Shower” was held after each mass at St. Mary’s for the Vietnamese family the parish was sponsoring. This was the first parish in the Archdiocese to initiate such a project and it was inspiring to see the response of St. Mary’s people, who donated more than 60 items and $400 in cash to help furnish the new home of Phan Hi Dung and his wife and three children. Gifts included appliances, dishes, linens, utensils, towels and silverware. As of July 1 that year, the United States Catholic Conference Migration and Refugees Service, working with diocesan resettlement directors and Catholic Charities officials, had found homes and jobs for more than 11,000 refugees and expected ultimately to account for a far greater number. These efforts received official recognition from President Gerald Ford when his Advisory Committee on Refugees publicly lauded the USCC’s work. Pham, his wife, two teen-aged daughters, and eight-year-old son escaped into Guam following the Communist takeover of their country. From a relative who was a Catholic editor in Saigon, the received the name of Tom Fox, the reporter who had served on the Saigon bureau of the New York Times, and wrote to him for sponsorship. Pham, having been an Air Force officer with a telecommunications background, had several good job leads at this point, and expected to begin interviewing as soon as he arrived in Detroit in the middle of July. A welcoming committee from St. Mary’s was at Detroit Metropolitan Airport to greet them. 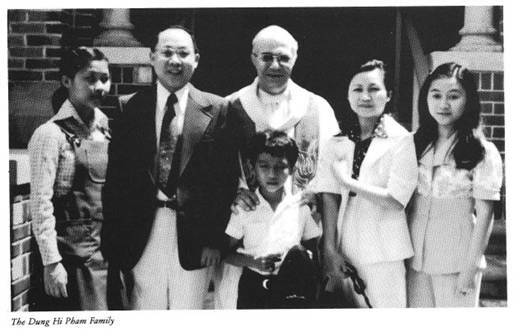 St. Mary’s has subsequently sponsored two other Vietmanese families. September 25, 1977, brought a special celebration to St. Mary’s – the commemoration of the School Sisters’ 125th anniversary at the parish. Now was the time that they could be showered with lavish praises – and they were. Congratulatory messages came from every corner of the world and from the Orders which had served with the Sisters in the years before the Holy Ghost Fathers came. 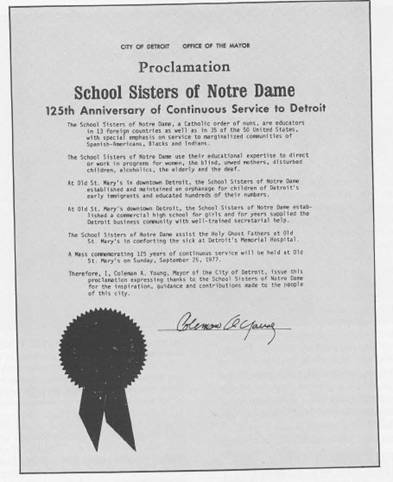 This was also the year that a group of Jewish people, mainly from the Lafayette Park area, but also consisting of business commuters to the downtown area, decided to accept Father Nader’s generous offer of rent-free use of a portion of Old St. Mary’s School (the oldest school building in Michigan) to hold worship services. They named their fledgling synagogue “T’chiyah” which means “renaissance” and decided to limit its membership to 118 in order to maintain the feelings of a closely knit community. Rather than affiliate with Orthodox, Conservative, or Reform Judaism, congregants decided to celebrate and teach all aspects of their religion, people, history, liturgy, music, literature, and arts while embracing Jews of various economic backgrounds and ages. Father Nader said, “St. Mary’s tries to respond in any way we can to people in need.” The founder of his own religious order, the Holy Ghost Fathers, had been born Jewish.